When managed by a new ground control system, GPS III satellites will offer triple the accuracy and eight times the anti-jamming capabilities of the satellites currently comprising the U.S. Air Force’s GPS constellation. Users military and civilian will reap ample benefits. Everything changed for space-based positioning, navigation and timing around the world on Dec. 23, 2018. Or maybe it didn’t. The innovations heralded by the launch of the first GPS III satellite will take years more to occur. We tabulate here the advances that Generation Three will bring over GPS-to-date, and review the timeline for their actual arrival. While these new capabilities exist — in concept — in space, they can’t be leveraged on the ground (or in the air, or at sea) until a sufficient number of additional GPS III satellites have joined the constellation, and until a new ground control system comes online. This will occur — perhaps — in 2023. At that time the satellites’ talents will be unleashed. “As more GPS III satellites join the constellation, it will bring better service at a lower cost to a technology that is now fully woven into the fabric of any modern civilization,” stated Lt. Gen. John Thompson, commander of the U.S. Air Force’s Space and Missile Systems Center and the Air Force’s program executive officer for space. The many GPS III upgrades should make the service more reliable and accurate for civilians, more secure against those who want to jam military users, and more cyber-secure for everyone. 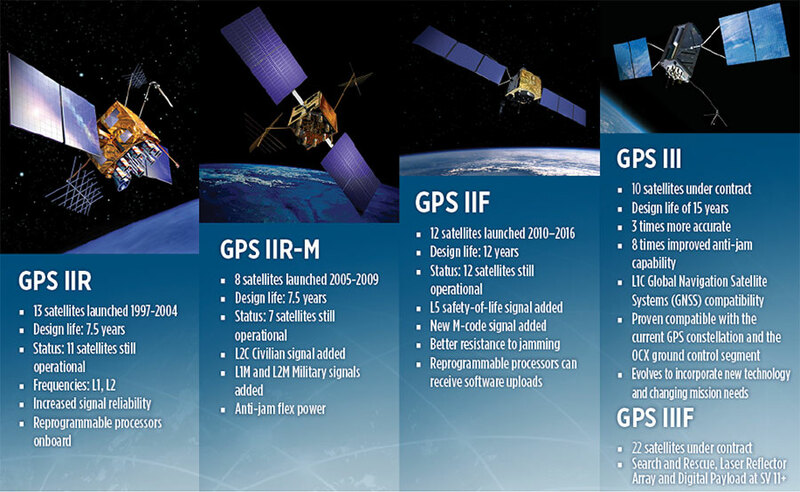 GPS constellations have grown through six major iterations since 1978. The sixth, GPS IIF, rose during the years 2010 to 2016. Those 12 satellites are all designed to last 12 years. Some of their notable features include the ability to receive software uploads, better jamming resistance and increased accuracy. GPS III, the seventh generation, will launch nine more satellites to join SV01 already in space. GPS III SV02 is scheduled to launch in July of this year, SV03 in late 2019, and SV04 in 2020. The final III payload should rise in 2023. From that point on, the follow-on era of GPS IIIF takes over. How Long, How Long? “Projections for how long the current constellation will [continue to] be fully capable have increased by nearly two years to June 2021, affording some buffer to offset any additional satellite delays,” reported the Government Accounting Office at the end of 2017. This provided some schedule buffer for launching the first GPS III satellite, but it did not reduce the desire to launch as soon as the booster rocket became available. The new birds will introduce new capabilities to meet higher demands of both military and civilian users: once filled out, the GPS III constellation will bring three times better accuracy and up to eight times improved anti-jamming capabilities. Spacecraft life requirement will extend to 15 years, 25 percent longer than the latest GPS satellites and twice the original design life of the oldest satellites on orbit today. 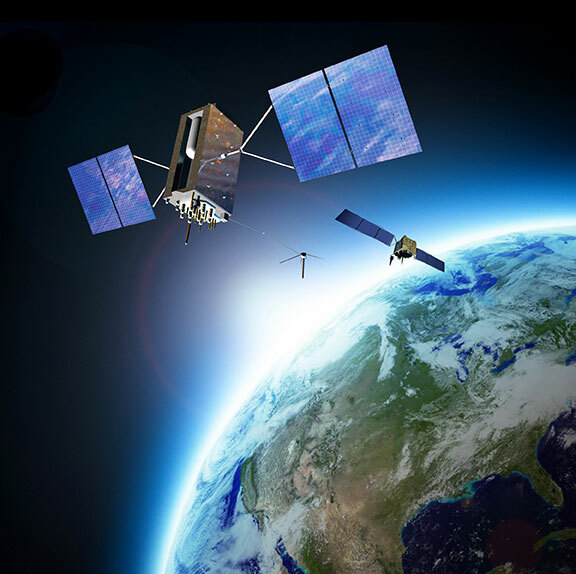 The new L1C civil signal broadcast by GPS III is an interoperable signal with other international global navigation satellite systems, like Galileo, improving connectivity for civilian users. 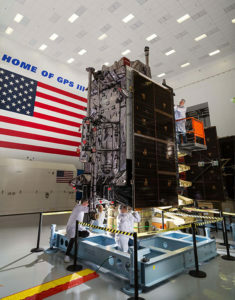 GPS III will eventually actualize full M-code capability — carried aboard the IIR-Ms and IIFs but not yet completely implemented — in support of warfighter operations. 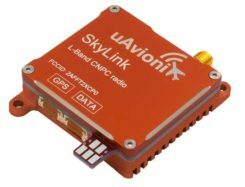 GPS III M-code capability exceeds that of GPS IIR-M and GPS IIF. GPS III will complete the deployment of the L2C civil signal and the L5 safety-of-life signal capabilities that began with \GPS IIR-M and GPS IIF satellites. Finally, GPS III will enact improved integrity: the ability of the satellite to detect and issue alerts on its own reduced accuracy, should that phenomenon ever occur. Military Signal Power Up. Encrypted M-code signals will be up to eight times more powerful than currently. This makes them more reliable. but also enables the sats to overcome efforts to jam their signals. Other signals also offer increased signal power at the Earth’s surface. L1 and L2: −158.5 dBW for aC/A code signal and −161.5 dBW for the P(Y) code signal. L5 will be −154 dBW. L2C, the second open GPS signal, after L1 C/A, has been available from every new GPS satellite since the first IIR-M launch in 2005. L5, the third open GPS signal, became available with the first IIF launch in 2010. Now L1C, the fourth open GPS signal, joins the band, broadcasting from every new GPS satellite, starting with the recent GPS III launch (see First Light). Testing, Testing. Using the Air Force’s Back-to-Basics program, which involved early prototyping and simulations, Lockheed Martin developed GPS III with an approach that involved rigorous quality-build certificates, component testing and system-level testing. The comprehensive requirements verification and validation process ensured more than 30,000 requirements were achieved. The system functional qualification includes the performance verification in multiple environmental tests, including the acoustic, thermal vacuum (TVAC) and electromagnetic spectrum. To date, more than 90 percent of parts and materials for all 10 GPS III satellites have been received from more than 250 aerospace companies in 29 states. Harris Corporation is a subcontractor to Lockheed Martin for development and production of GPS III Mission Data Units (MDUs) and transmitters for the GPS space section. Six have been delivered. The Harris MDU, together with the Atomic Frequency Standards and the L-band transmitter equipment, make up the Navigation Payload Element. The MDU performs the primary mission of the GPS satellite: generation of the navigation signals and data on a continuous basis. The MDU controls the generation of the precise timing signals used for navigation signals while distributing the timing signals to other satellite components. This MDU is 70 percent digital. The next to come, aboard GPS IIIF satellites, will be fully digital. Advanced payload technology provides a partial answer. Lockheed Martin and Harris point to new payload capabilities with built-in flexibility to adapt satellites in orbit to technology advances, as well as changes in missions. According to Harris, the fully digital navigation payload will provide the ability to change and upgrade the satellites incrementally over mission life. In late 2017, Lockheed announced a partnership with NEC Corporation to introduce artificial intelligence for computer learning in orbit. The company touted significant advances in processors and a move toward next-generation antennas, arrays and transmitters to drive more satellite flexibility, capability and resilience. GPS III’s military upgrades require new ground control stations, a replacement effort called OCX that has suffered repeated delays and cost increases, due to the complexity of the programming and requirements modifications. The new jamming-resistant military signal will not be available until the new, highly complex ground control system is available, and that is not expected until 2022 or 2023. Delay and cost considerations were driven in part by full implementation of all Department of Defense 8500.2 “Defense in Depth” information assurance standards without waivers, giving it the highest level of cybersecurity protections of any DoD space system. Deliverables for GPS OCX are divided into three blocks. Block 0 delivery took place in fall 2017, enabling it to support the December launch. Block 1 delivery will take place in 2021, providing full operational capability to control both legacy and modernized satellites and signals. Block 2, delivered concurrently with Block 1, adds operational control of L1C and modernized M-code. Before December’s launch, OCX underwent rigorous cybersecurity vulnerability assessments that tested the system’s ability to defend against both internal and external cyber threats. GPS OCX prevented the broadcast of corrupt navigation and timing data in all tests, bolstering the program’s readiness for GPS III. The new Harris navigation payload offers a smooth transition to use of OCX. 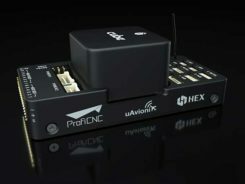 The payload for the first 10 GPS III satellites has been verified for OCX compatibility so the same OCX commands will seamlessly port to the Harris fully digital design, minimizing integration risks and associated costs. According the the GAO, “Full M-code capability —which includes both the ability to broadcast a signal via satellites and a ground system and user equipment to receive the signal — will take at least a decade once the services are able to deploy military GPS user equipment (MGUE) receivers in sufficient numbers.” The April 2019 issue of GPS World will review M-code implementation across U.S. DoD platforms. In spring 2018, Lockheed Martin submitted a proposal for the GPS III Follow On (GPS IIIF) program, which will add enhanced capabilities to the satellites. New hardware — a high-gain directional antenna — aims signals in a spot beam at a limited area, but blasts the signal at high power for strategic use by the military. Inter-Satellite Links. Block IIIF satellites will carry laser retro-reflectors to enable orbit tracking independently of the satellites’ radio signals, which in turn will allow satellite clock errors to be disentangled from ephemeris errors. A standard feature of GLONASS, this is included in the Galileo positioning system, and was flown as an experiment on two older GPS satellites, 35 and 36. 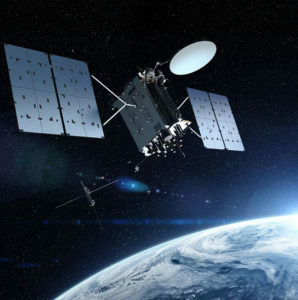 In September 2018, the Air Force selected Lockheed Martin to build up to 22 additional satellites under the GPS IIIF program.